A recent article in the New York Times Well Blog weighed the pros and cons of eating before and after a workout and what nutritional content the food and drink should have. Go too surgery beforehand and you may have a sugar low at the end of the workout. Carbohydrate rich food or drink within an hour of the workout was recommended and protein along with it was considered good but not actually necessary, even for heavy weight lifting. I recommend you find one that has the lowest sugar content you can find and ideally doesn’t contain corn syrup. Or better yet, make your own. Extra points for organic ingredients! In a medium saucepan, whisk cocoa and sugar until lump free. Add water and salt and mix whisk well. Cook over medium heat, bringing it to a boil. Keep boiling until thick, stirring to keep from scalding. Remove from heat and allow to cool. When cool, add vanilla. Pour into an airtight glass container and keep refrigerated. Can store for one month. 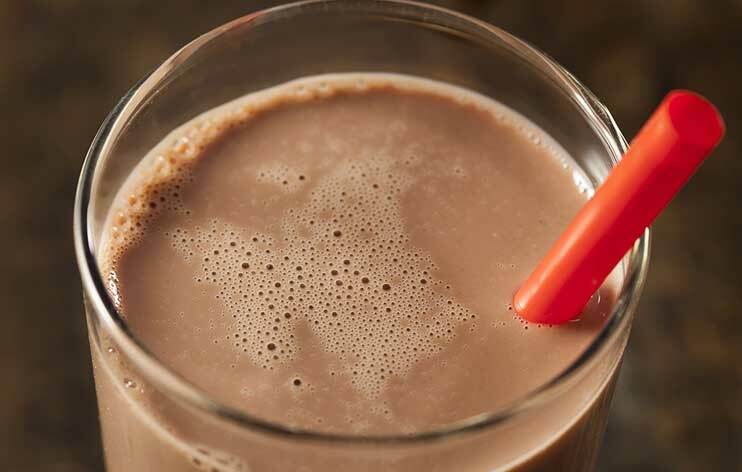 One tablespoon of syrup for every 8 ounces of milk should make for a nice glass of chocolate milk, add more to taste.